A revolution in brush storage and organization for the classroom! 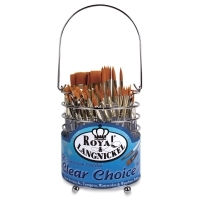 Royal Langnickel introduces their Classroom Caddies, stainless steel, six-compartment storage containers complete with a handle for carrying brushes from table to table with ease. 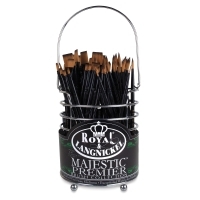 Each Classroom Caddie is filled with a different assortment of Royal's most popular brushes for classroom use. Soft-Grip Classroom Caddie, Taklon — Ergonomic, acrylic handles and better-quality Taklon filaments have made Royal one of the most recognizable and popular brush lines for teachers. This 72-brush assortment includes 12 each of Rounds in sizes 3, 6, and 10; Flats in sizes 8 and 12; and 3/4" Wash brushes. 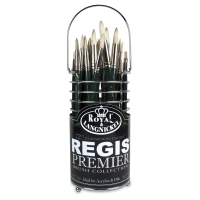 Regis Classroom Caddie — Royal’s Regis brushes are made of interlocked Hog Bristle that is strong, resilient, has generous paint-holding capability, and wears well. These brushes are ideal for high-viscosity oil and tube acrylics. The 72-brush assortment includes 12 each of Rounds in sizes 3, 7, and 12; and Flats in sizes 2, 6, and 10. Snowhite Classroom Caddie — Snow-white Taklon filaments and easel-length gold handles make this better-quality brush assortment ideal for any high-viscosity, water-based medium. This combo assortment contains 12 each of Rounds in sizes 4, 8, and 12; and Brights in sizes 2, 6, and 10. 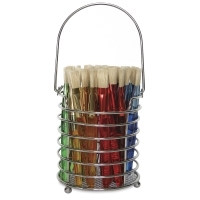 Sunburst Classroom Caddie — These better-quality Taklon brushes have painted wood handles and nickel ferrules, perfect for any water-based medium. The 72-brush assortment includes 12 each of Rounds in sizes 3, 6, and 10; Flats in sizes 6 and 10, and 3/4" Wash brushes. Clear Choice Classroom Caddie — These clear-handled brushes are a standard in the educational market. Ideal for use with water-based mediums. 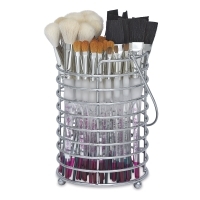 This 72-piece assortment includes 12 each of Rounds in sizes 3, 5, and 10; Flats in sizes 4 and 10; and 3/4" Wash brushes. Aqua-Flo Classroom Caddie — These durable plastic brushes are a convenient and helpful tool that puts a fluid reservoir at your student's fingertips. This set contains 12 each of small, medium, and large round brush tips crafted of good-quality Taklon for use with any water-based medium. The Aqua-Flo brush minimizes water spillage and keeps painting areas cleaner. 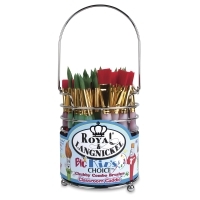 Big Kid's Choice Classroom Caddie, Set of 48 — This 48-piece set contains a selection of Royal's most popular Big Kid's Choice brushes, including 24 each Flat and 24 each Round, in a variety of sizes. Majestic Classroom Caddie — This assortment features Royal's best-quality Taklon filaments in a combination that makes them ideal for any water-based medium and exceptional for watercolor. The combo assortment includes 12 each of Rounds in sizes 3, 6, and 10; Flats in sizes 6 and 10; and 3/4" Wash brushes. Soft Grip Classroom Caddie, Natural Bristle — This caddy holds 72 natural hair brushes in a variety of sizes, including Wash, Mop, and Deerfoot. Chubby Flat Classroom Caddie — This is an ideal assortment for teaching elementary students. The brushes are made with colorful, sturdy acrylic handles and good-quality bristle hair. This assortment includes 48 Flat brushes. Chubby Round Classroom Caddie — This is an ideal assortment for teaching elementary students. 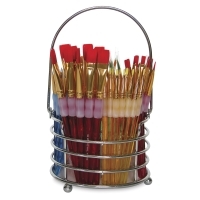 The brushes are made with colorful, sturdy acrylic handles and good-quality bristle hair. This assortment includes 48 Round brushes. Chubby Combo Classroom Caddie — This is an ideal combo assortment for teaching elementary students. 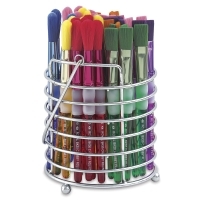 The brushes are made with colorful, sturdy acrylic handles and good-quality bristle hair. This assortment includes 24 Round and 24 Flat brushes. 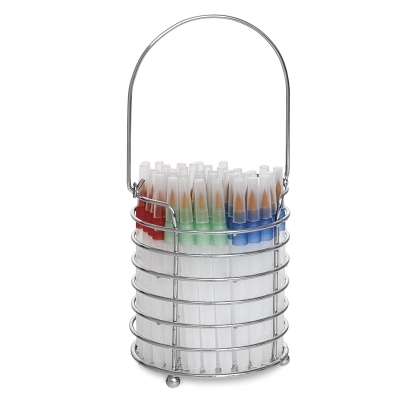 Big Kid's Jumbo Combo Classroom Caddie — This set contains a selection of popular Big Kid's brushes. Introduce your students to a variety of brush styles with this 48-piece assortment. The set includes 12 each of size 10 and 16 Round, size 12 Flat, and 3/4" Wash brushes. 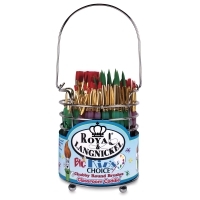 Big Kid’s Choice Classroom Caddie, Set of 72 — This set contains a selection of Royal's most popular Big Kid's Choice brushes with grippers. Introduce your students to a variety of brush styles with this 72-piece assortment. The set includes 12 each of size 10/0 Liner, size 1/4" Angular, size 4 Round, size 2 Filbert, size 6 Shader, and 5/8" Wash brushes. 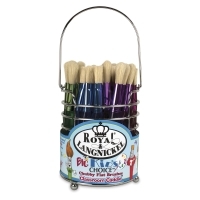 Big Kid's Choice Combo Classroom Caddie — This set contains a selection of Royal's most popular Big Kid's Choice brushes. Introduce your students to a variety of brush styles with this 72-piece assortment. 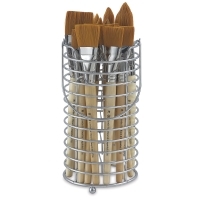 The set includes 12 each of size 2, 6, and 8 Round, and size 4, 8, and 12 Flat brushes. 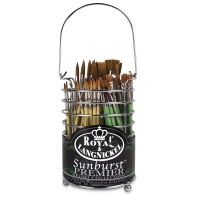 Jumbo Premier Classroom Caddie — Use Royal Jumbo synthetic brushes with heavy body acrylics on heavily textured surfaces, or even when you need a gentle brush for watercolor washes. The brush hairs are contained in nickel-plated brass ferrules and attached to thick natural hardwood handles with a lacquered finish. 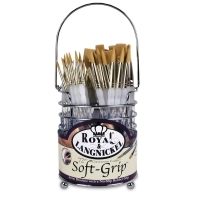 This set includes 18 Royal Jumbo Brushes — six each Round and Flat #30, two each Round and Flat #40, and one each Round and Flat #50, in a convenient Royal Caddie carrier. 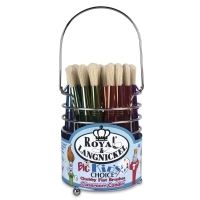 ® Royal & Langnickel is a registered trademark.™ Classroom Caddie, Big Kid’s Choice, Magestic, Regis, Snowhite, Soft-Grip, and Sunburst are trademarks.